My four-year-old shrieked when he brushed up against a spooky display at the craft store. 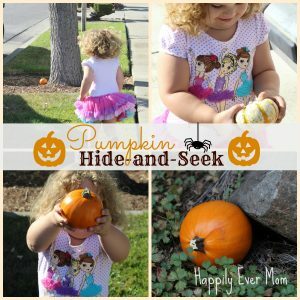 It’s September, but we were on the hunt to find a fun, Halloween activity that we could do at home. That’s when I realized that my son wasn’t shrieking out of fear (honestly, most of the Halloween displays freak him out). Instead? He was shrieking with pure JOY. A tiny bag of foam stickers filled with glittering ghosts, smirking pumpkins, and smiling spiders. Anyway, I don’t know what it is about foam stickers, but my kids LOVE them! So, I dreamt up a quick activity to do with those shiny, enticing foam stickers, after seeing some inspiration on Pinterest. 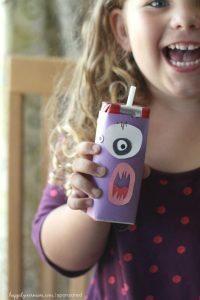 Here’s how to put together this quick Halloween activity which you can take on the road or do at home. Either way, your preschooler will LOVE this. Are you a Pinterest fan like I am? If you love it over there, come hang out with me. I love to scroll through my feed and find inspiration for activities to do with my kids. In fact, you’ll want to check out my favorite board (my FUN activities board) because it will have more posts like this one. See, the thing is that you can find some amazing inspiration on Pinterest, but sometimes there are ideas that just aren’t worth doing (that’s why there’s a hashtag #pinterestfail – have you seen that? They’re actually hilarious.). When I came across this pin (here’s the original idea), I knew that my kids would love to try it out. I took inspiration from that simple pin and created a fun, Halloween version for my own kids. You could use this activity in the car, as a busy bag activity, or to keep your kids occupied while you make dinner. It’s totally up to you. Pen (I used a sharpie, but it was messy. I highly recommend just outlining the shapes with a pen instead). I traced the stickers onto a separate piece of paper, but you could trace them directly onto an empty paper towel roll if that’s what you’d like to use. Once you’ve traced the stickers, tape the paper on the outside of the bottle. 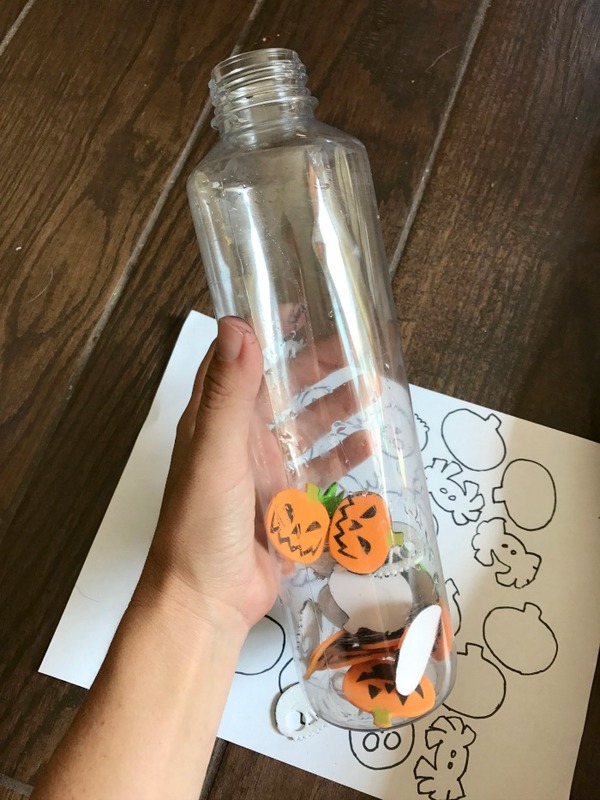 Put stickers inside the bottle to keep them contained and portable (for example, if you’re taking them on a road trip in the car). 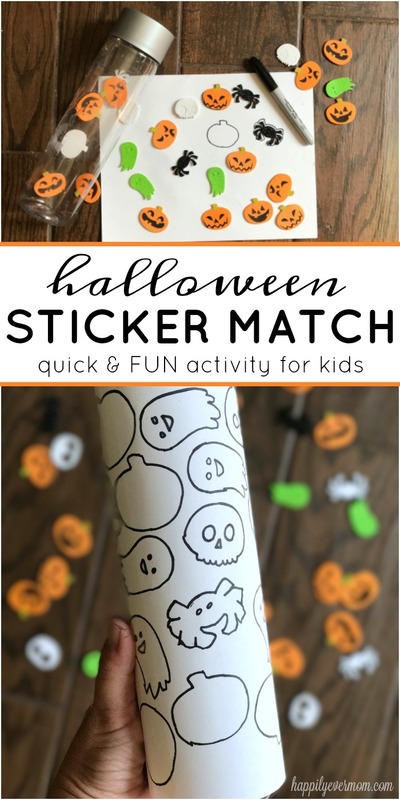 Let kids match the stickers with the outline! Note: I used a water bottle so that my son could put the trash into the bottle. I don’t love all the backings from the foam stickers going all over the place which is why I used a bottle instead of a paper towel roll. Also, if you take this in the car, you can easily store all of the stickers inside the bottle like in the photo above. 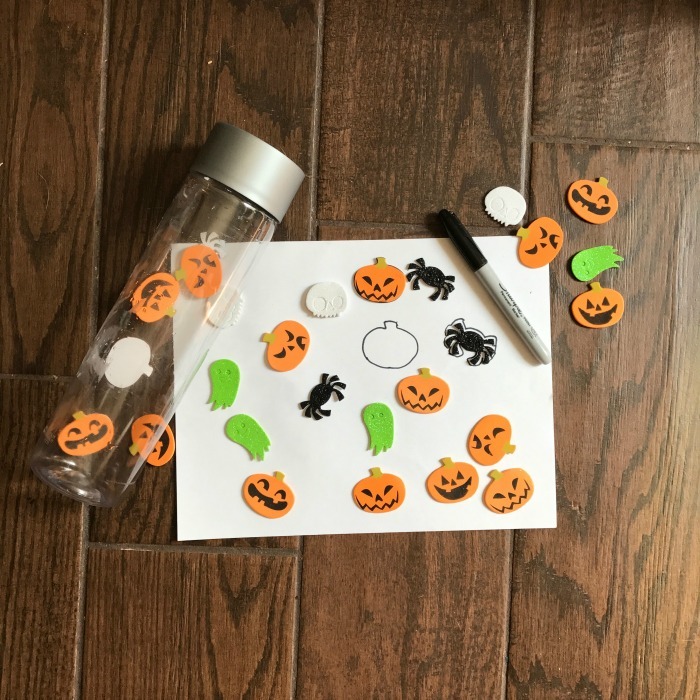 The best part about this Halloween activity is that you can take the paper off and make another matching puzzle with more foam (or regular) stickers. We also found that we were able to take off the foam stickers from the bottle and reuse them for another project. My son loves to play with foam stickers, so that was a huge plus. And, since we’ve been using these foam stickers a lot lately, I’m feeling less suspicious about those smiling spiders. Will your child love this as much as we did? 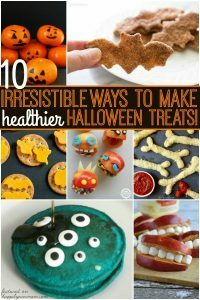 Here are some more Halloween Activities for Preschoolers. And, you can find tons of ideas on our Instagram or over on our Holiday board on Pinterest!